Sorry, I got carried away there! Let me start again. This is my first ever Let’s Read, and it’s for a 4e product that holds a special place in my dark, shriveled heart. The Shadowfell: Gloomwrought and Beyond was a boxed set mini-campaign released in 2011 in conjunction with the Essentials Heroes of Shadow book to give emo adventurers a grim playground of dark delights to explore. The authors were Andy Clautice and Matt Goetz, WotC first-timers, and Erik Scott de Bie, who would go on to work on the very well-received 4e Neverwinter campaign setting. I think one of the things that makes this campaign setting really interesting is that it doesn’t try to be all things to all people. The materials largely focus on the city of Gloomwrought and its immediate surrounds, giving it a level of detail that brings it vividly to life (er, death?) as a chaotic metropolis full of murderous factions, poisonous intrigue, and vile secrets. And while the included encounter book contains encounters for adventurers from levels 7-23, the campaign setting as written is really gonna shine for early-to-mid paragon tier heroes. It’s an incredibly atmospheric locale to base part of a long-running campaign in, full of dark secrets to unearth, meaty plot hooks to follow, and conniving NPCs and shadowy organizations who might be allies one moment, foes the next. The Shadowfell boxed set came with two books: the 127-page campaign guide and a shorter book of sample encounters. It also featured a poster map, with the city of Gloomwrought on one side and an atmospheric encounter map featuring some gloomy city streets on the other. There were also several sheets of punch-out tokens for monsters. Both were done in a flat matte finish which doesn’t seem as attractive as the glossy finish that other 4e products used but kind of makes sense for the product. Incredibly, as I write this you can still get the original boxed set new on Amazon for $29.90! 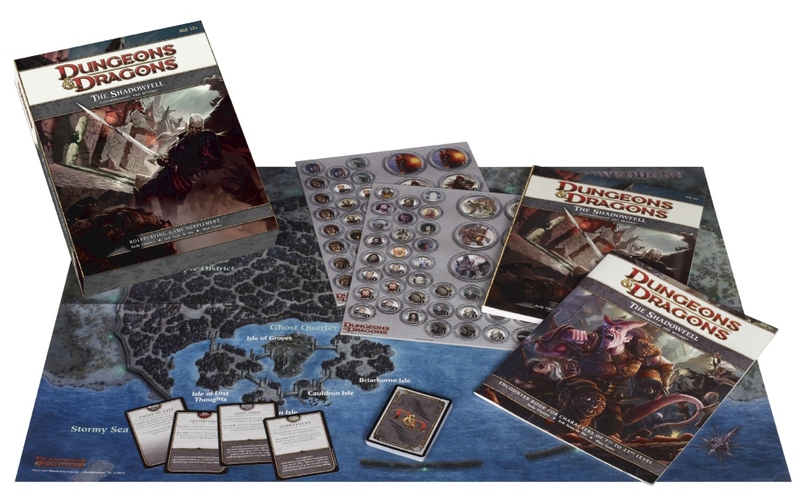 Of course you can also get the materials slightly cheaper in PDF form on DriveThruRPG, but these 4e boxed sets don’t stay in print forever, and your money nets you two books, tokens, a deck of cards, and a fold-out map. I’m not trying to sell anything to anybody, but that seems like a pretty good deal to me. If I thought I might be even mildly interested in this stuff, I know what I’d be buying! A word to the wise, traveler, about **DREAD SPOILERS**. 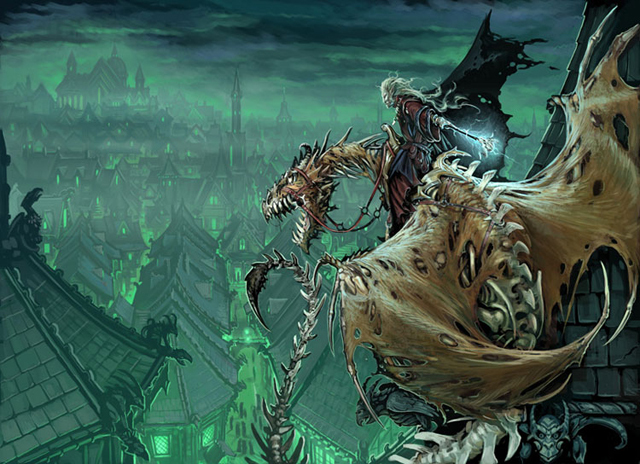 Gloomwrought is a city abounding in dark mysteries that have vexed many an adventurer. For the most part these mysteries are left to your twisted imagination, but towards the end of the campaign guide book a chapter called Dark Threats will reveal not just some stat blocks but a few sinister truths as well. The Keepers keep many secrets, and I'm not just talking about an aura with a radius of 2. If you want to remain pure and innocent of such fell knowledge, I suggest you do not venture too deeply into this thread without a guide! I shall mark appropriate sections with spoiler tags but not all commentors may be so... accommodating. And now we are ready to begin. So fish that skull t-shirt out of the back of your dresser, slap on some black eyeliner, and take my hand as we pass through the veil together and read that most METAL of all 4e campaign settings: The Shadowfell - Gloomwrought and Beyond!!! It's a great little setting. And easily translated to other systems. The flat matte finish on the tokens doesn't seem to have been a setting decision (or at least not only a setting decision), because Monster Vault: Threats of the Nentir Vale has the same finish. I think the Shadowfell tokens were done better than those in MV:TotNV, however, because the creature images in the latter are sometimes a little too indistinct. Thanks for doing this read through, by the way. I don't usually read these, but I have this box set and would be interested in your thoughts on it before I start making use of it. That's true. Other than a handful of monsters, there is very little here that is specific to D&D 4e mechanics. 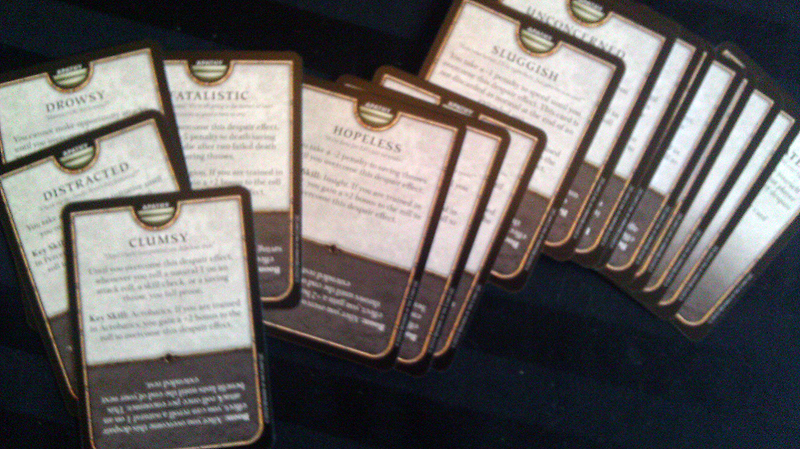 And as we'll see, the Despair Deck can be used almost anywhere. Huh. I have MV:Nentir Vale and I don't remember that about those tokens. I'm too lazy to dig them out and look at them, though, so I'll take your word for it. I think it might also have to do with the colors everything is printed in. It all just looks DARK. My pleasure. If there is anything you or anyone else want me to address, suggestions are welcome. We begin our Let’s Read with the 127 page Campaign Guide, where we will be spending most of our harrowing sojourn in these dread lands. Hey, get a load of that dude’s epic sword! Seriously, it’s friggin’ ginormous. It looks like he can barely hold onto it. Nonetheless, he has apparently managed to make stabby-stabby with it, as there is a body sprawled on the ground in front of him. Judging by his piercings, spikey armor and weird emo hair he is probably a Shadar-Kai, about which we will learn more shortly. 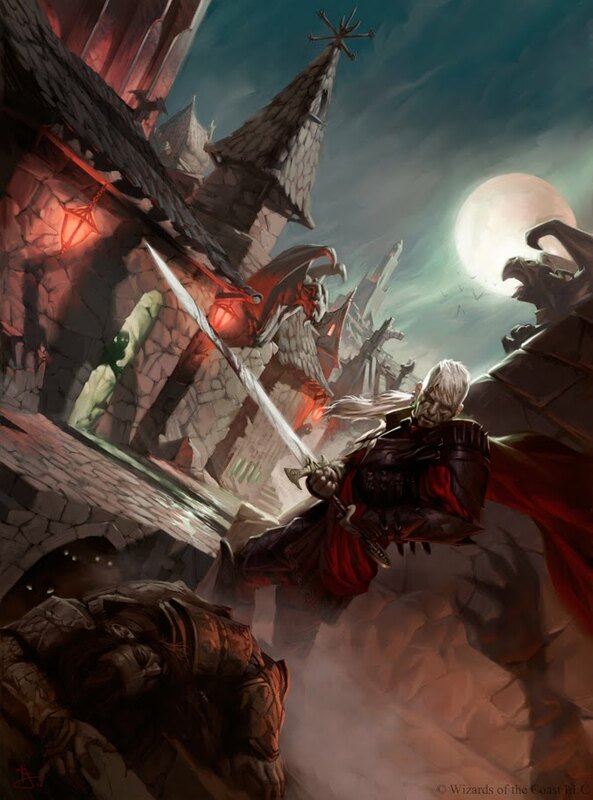 Behind him is a brightly moonlit street with gargoyles brooding over it and shadowy figures watching from doorways. Basically, it’s just another Tuesday night in Gloomwrought, THE CITY OF MIDNIGHT!!!! Enough with the cover, let’s crack this baby open. "The Shadowfell is a bleak realm that houses both the dead and those among the living who have embraced a dismal existence there. As a shadowy reflection of the world, the Shadowfell can manifest itself differently to visitors. The plane is an amalgam of differences and similarities to the world. Each person finds something both recognizable and disturbing in its grim landscape." When I first opened this chapter about the Shadowfell, I had a lot of questions about the physics of the place. I mean, it is basically the Plane of Death, right? So can living things survive there? What about the undead? Are undead creatures just basically living things there? Or do they become some sort of SUPER undead? What happens if you kill something in the Shadowfell? Like, do you totally see its soul?? Needless to say, I was excited that I would finally learn the answers. Alas, I was to be disappointed. An in-depth exploration of Shadowfell metaphysics this is not. We are told that it is a “Dark Mirror” of our own plane and that’s about it. Having read further, I can tell you that basically things work pretty much the same in the Shadowfell as the ordinary world with a couple of exceptions. One is that the spirits of the dead must traverse the plane to reach the palace of the Raven Queen. There is an endless stream of them constantly moving towards her domain of Letherna in the frozen north. The second difference is that over time living beings in this realm tend to succumb to ‘the gloom’ of the Shadowfell. This first manifests itself as apathy, numbness, and despair. If they do not fight against this they will simply fade away. A brief section here entitled ‘The Passage of Time’ notes that those who sink into gloom may also find that time seems to slow or stand still, even though out in the ordinary world it is passing at a regular pace. An unwary traveler might return home only to discover that everything they knew and everyone they ever loved vanished years ago. Otherwise, what we learn here is that the Shadowfell is a place where everything is awful and/or dangerous, all the tIme. As the book says, "In a game that’s set in the Shadowfell, it’s important to convey an atmosphere of terror, isolation, and death." That straight path through the mountains? Might shift suddenly and turn into a pit leading straight into the Shadowdark! Heinous threats and mortal danger lurk at every turn. And just in case danger happens to be on a coffee break, the PCs should be encouraged to THINK that it is lurking anyway. 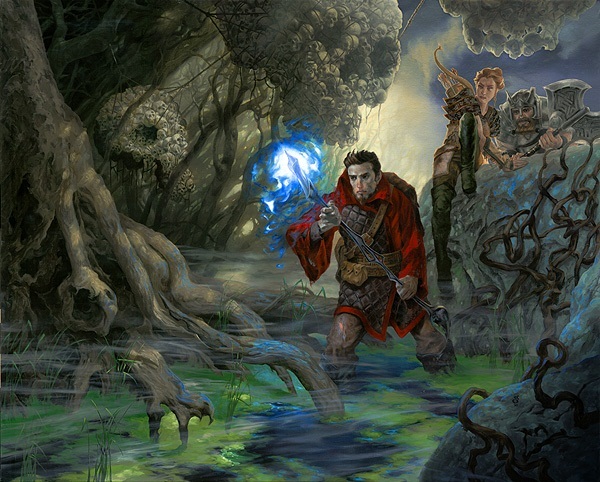 A sidebar for DMs entitled *Setting the Mood* recommends that the DM “batter the players’ nerves with ambushes, surprises, and sudden twists.” Having allies betray the PCs is a recommended tactic. You hear that, DMs? When the PCs are in the Shadowfell, it’s okay to play dirty! The next section is entitled *Getting to the Shadowfell*. There are actually lots of options (I mean, we’re all going there sooner or later, amirite?!?). Of those available, the most traditional D&D method is undoubtedly wandering into a portal without checking what’s on the other side first. Another option presented here is ‘Shadowmist’, as in “A shadowy mist rises out of the ground! You sense that you have been sent to a far away plane on a side quest, and that you will return when the quest is complete!” It’s a lovely in-fiction example of a DM Ex Machina. A third, more interesting option is a ‘Shadow Crossing’, which can manifest near powerful necromantic rituals. I like this idea because the players might feel that they have safely dispatched the necromancer and closed down his portal and still find themselves stumbling into the Shadowfell. The art at the beginning of the chapter appears to illustrate a party which has stumbled into a shadow crossing. Apparently they have failed their Perception checks and not noticed the Skull Trees, which might be a clue as to what has transpired. The last way to get to the Shadowfell is the ‘Dark Awakening’. It’s death, but with a twist: the Raven Queen decides you aren’t quite ready to come out of the oven yet, so to speak, so you are sent back to your mortal body, only now you’re in the Shadowfell. As an added bonus, sometimes when this happens there is a soul splitting effect, where an evil shadow version of you is created on another plane. So DMs, if you ever toyed with the idea of replacing the entire party with evil doppelgangers running around causing mischief (more than usual, I mean! ), here you go. A sidebar here notes that this book is far from the only source for information on the Shadowfell. Other recommended materials include the Manual of the Planes, the Monster Manuals, the Monster vaults, and the Death’s Reach adventure. A couple of Dragon magazine issues are also referenced. #376 featured the Revenant playable race, and #380 featured the Vistani. Jumping ahead a page, we will also learn that three of the Shadowfell’s ‘Domains of Dread’ have gotten magazine write-ups, in Dragon #368, #375, and #378. Not mentioned here are several issues of Dungeon Magazine which featured content or adventures set in Gloomwrought. I don’t have a comprehensive list, but I know of Movers and Shakers of Gloomwrought in #190, the adventure ‘Reign of Despair’ in issue #191, and another Domain of Dread in #210. If you know of others that should be listed you are welcome to chime in. Now that we have some idea of what grim perils await us in the Shadowfell and how to get there, we will pause for a moment to catch our shuddering breaths. Next time we will contemplate what sort of ghastly beings might dwell on this darkling plane, learn what sort of adventures might await us herein, and plumb the depths of the DESPAIR DECK!!! It always seemed to me that this box set was what happened to that planned but cancelled 4e Ravenloft Campaign Guide. Yeah, my understanding is that the components of the Ravenloft setting sort of got incorporated into a bunch of things like the Domains of Dread articles in Dungeon and Dragon magazines. Wouldn't be surprised if some of it found its way into this boxed set as well. Maybe that was the origin of the Despair Deck? Hey, thanks!! I'm having fun with it, so I'm glad you are too! I need to crack open MotP and see what was originally written about Gloomwrought and the Shadowfell there. But yeah, it is a cool boxed set, although once you factor in overseas shipping it could get unduly expensive.